On Wednesday, April 6, Esri will be hosting two busloads of 11th grade students from LA’s Roosevelt High School and one busload from LA’s Diego Rivera Learning Complex. 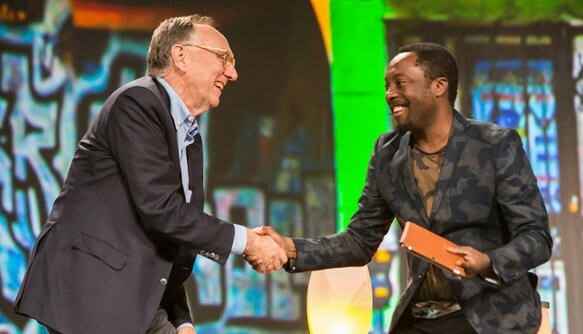 Esri’s Jack Dangermond and will.i.am at the 2013 Esri User Conference talking about the importance of education on the plenary main stage. Esri’s work with these high school students began a few years ago, after Esri’s president and founder Jack Dangermond met musician will.i.am, a founding member of the The Black Eyed Peas. This unlikely pairing bonded over a common interest in introducing the next generation to technology and the sciences. wil.i.am’s i.am.angel Foundation and Esri have been partnering ever since to provide ArcGIS software to the students of the Math, Science & Technology Magnet Academy at Roosevelt High School in Boyle Heights, Los Angeles. With the help of some spectacular teachers – Mariana Ramirez, Alice Im, Nicki Morales, and Enrique Legaspi – and Roosevelt High School principal Jose Espinoza, these students have been learning how to use ArcGIS online on HP workstations and create presentations with Story Maps. The first year of the program saw 80 students using maps to start transforming their Boyle Heights neighborhood. They looked at brown fields and green spaces in the community, and presented their findings at the Esri User Conference on the plenary mainstage. The i.am.angel Foundation and Esri have worked together for the past three years to assist high school juniors in STEM and igniting a passion to continue learning. Check out the website for more information. Now, more than 200 students have gone through the program, incorporating GIS technology, including mapping and data collection, into their year-end research projects. The projects this year focus on social justice. Some of the presentations include heavy topics like lead contamination, family deportation, racial integration in schools, and restorative justice and gangs. Check out this video produced by Esri partner HP about the school. And don’t miss the final projects at Esri UC this year!